Are you on the search for good quality Christian fiction books for your children? Then I highly suggest checking out the books from B&H Publishing. B&H Publishing believes, "Every Word Matters™", so they seek to provide intentional, Bible-centered content that positively impacts the hearts and minds of people, inspiring them to build a lifelong relationship with Jesus Christ. I have reviewed books in the past from B&H Publishing like the Hey God.....Jonah book and am always blown away with the terrific writing, illustrations and content. We received a copy of Audry Bunny to review. The book is a 32 page, full color hardcover book with a jacket. The author is Angie Smith and the illustrator is Breezy Brookshire. This was such a fabulous heart-warming book and teaches a very important lesson.You will fall in love with the beautiful illustrations! The book is about a stuffed bunny who has been sitting in a bin at a store for quite sometime due to a smudgy defect over her heart which makes her imperfect. Because of the smudge children look her over and go for the other stuffed animals instead. Bunny is sure she will live in the bin forever. 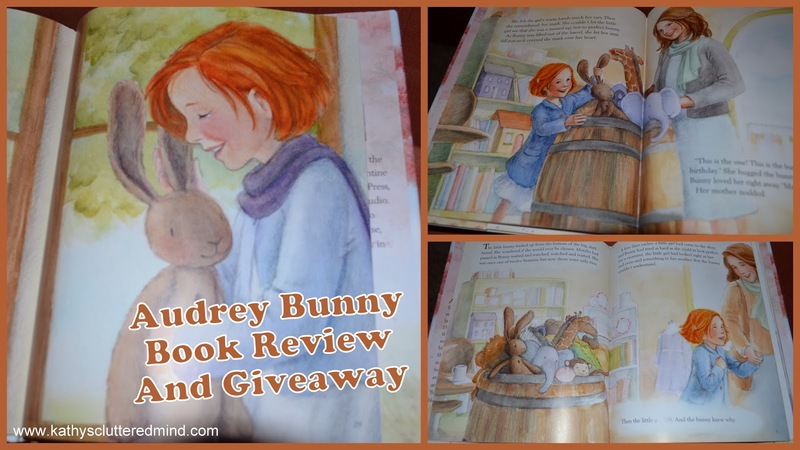 One day a little red-haired girl named Caroline enters the store and picks up the bunny, but sadly the little girl puts the bunny down and leaves store. Bunny is sad and alone again. A few days later the little girl comes back and suprisingly picks out the little bunny as her birthday present. She names the bunny Audrey after her grandmother. Audrey Bunny is afraid to let Caroline see her ugly smudge so she tries every way she can to hide it. One day though Caroline takes Audrey Bunny to school with her for show and tell. Audrey is devastated and scared that Caroline and all the other children will find out about her smudge? 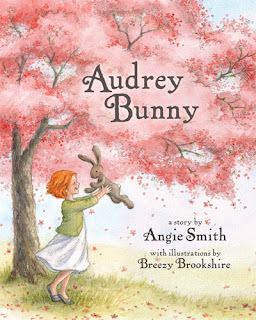 But in the end Audrey Bunny finds out that Caroline picked her because of the smudge. The book ends with a fabulous verse, "I praise you, for I am fearfully and wonderfully made. Wonderful are your works; my soul knows it very well. Psalm 139:14. The story teaches children that you don't have to be perfect to be loved and that being different is okay. This was very a important lesson for my daughter to hear because like me she suffers from low self esteem. We discussed how we should love every one regardless of how they look. We also talked about how God picked us to be His children and that we are all special and wonderfully made by Him. And that He doesn't care about our faults or imperfections. Both my children 7 year old daughter and 6 year old son loved the book. This is a great book for children and made the perfect bedtime story. Breezy Brookshire is the illustrator behind Clementine Pattern Co, Noble Rose Pres and The Breezy Tulip Studio. She shares a home studio with her sister Emily Rose, and lives with her family in Marion, Indiana. The hardback version can be purchased on Amazon right now for $10.79. It is also available in eBook format too. You can also purchase off the B&H website from other retailers for $14.99. B&H has graciously offered to giveaway a copy of the this amazing book to one lucky reader. Only the first entry is mandatory. Other entries are optional and give you extra chances. This giveaway is not affiliated with Facebook in any way. The winner will be posted on the blog and will be emailed. Winner must reply within 48 hrs with their contact information or another winner will be chosen. Prize will be mailed via the marketing company. Oh that is really neat!!! Love art projects for everyone! Cool idea! I like this... My daughter just got into scrap booking I will see if she wants to add these to her book. This sounds like a great lesson to teach our kids and it looks beautifully illustrated as well. I heard Angie speak at a conference and I know her writing is as talented as her speaking ability. I would love to try to make a tiffany window! That sounds like a lot of fun! Thanks for all the great resources as I am a new homeschooler! I LOVE Breezy Brookshire's art, and the story sounds like one I would like to add to our family library! This looks like a great gift book for Christmas! These are such great homeschooling resources! I'm always looking for sweet stories for the kids, preferably sans trains. These are great resources! I don't homeschool but still fun for my pre-schooler at home to get her ready for school! The See the Light program seems like a great art program for homeschooling! I love Tiffany windows too! I love a good children's book, and there is a special kid in my family who would love to recieve this as a Christmas present. I will pass this on to my homeschooling friends. Sounds great! awesome, we homeschool I will have to check this out --- thanks! I haven't heard about Tiffany Window before, but seems like a really great activity! What a fab resource for my homeschooling friends! What a fun and creative activity for my budding little artists! Thanks for sharing. Wow, this is a great page for kids to work with and not realize they are learning at the same time. Thanks for sharing this! I love learning that is disguised as play. This is a great thing for kids. What a great page for kids, so creative! I'm looking for lessons to use this winter. Thanks for sharing! Thanks for sharing this great freebie! and free resources are always great. It was nice of you to share this. Children learn so much through art, it is good to put it into as many lessos as possible. Thanks for sharing this. What a great freebie! These are really neat! They remind me of high school when I was in electronics shop. Sharing on FB...nice offer. I think this book would make a very nice holiday gift. This sounds like something my boys and I could enjoy doing together. Thanks for the review. I am sure Caleb would enjoy this. It is a computer GEEK. :) Great holiday gift idea...thanks! I know that my oldest son would really love these because he is always taking things apart and creating new and different things! Great review too! Going to sign up! This sounds like an awesome program. Great idea! My son is a complete computer geek. I bet he would love this kit. So now you can geek out with your kids all you want. This kit looks like fun and like the learning potential is amazing! I love all of the amazing things you can get for encouraging kids to learn and explore at home now! Pretty cool, I bet you kids really enjoy putting the gadgets together. What an awesome project! Not only did they have a blast, but they learned too! THis sounds like such a great project. My daughter is almost 7, this would be great for her! This sounds like such a fun project. I love learning ideas that are like play too. I think that when we are young, we al think we will be something different that what we actually are. I homeschooled my daughter and I know she would have loved this. My son would love it but truthfully I want to build one too! how cool is this! what a fun project to build! Great freebie! My daughter loves art. As a matter of fact, she is starting an art class tomorrow. I would like to win, because this would be a great book for my daughter. Thanks for the giveaway!